Dr Abdullahi Tasiu Abubakar is a lecturer at City, University of London, with extensive experience in broadcast, print and online journalism practice both in the UK and in West Africa. He obtained his PhD in Journalism and Mass Communications from the University of Westminster in London – with no corrections. He has worked for the BBC World Service as a producer in London and served as its Abuja Bureau editor in Nigeria. He has also worked for a few Nigerian media outlets, particularly the Trust newspapers, for which he is still an editor-at-large. Abdullahi has covered many major news events in Nigeria, Liberia, Sierra Leone and Cameroon. He won several journalism awards, including Nigeria’s Best Newspaper Reporter of the Year and Nigeria Union of Journalists’ (NUJ’s) Certificate for Professional Excellence. Before joining City in 2013, Abdullahi was a visiting research fellow at the Africa Media Centre, University of Westminster, where he was selected as one of the outstanding early career researchers whose works were showcased by the University at the launch of its new Graduate School in 2012. He is an analyst for the US-based Freedom House. His main research interests are media audiences, strategic communications, media in Africa and cultural studies. Abdullahi welcomes potential doctoral candidates, especially those with interests in transnational audiences, media in Africa, international broadcasting and public diplomacy. Tasiu Abubakar, A. (2016). Communicating violence: The media strategies of Boko Haram. In Bunce, M., Franks, S. and Paterson, C. (Eds. ), Africa’s media image in the 21st century: From the ‘Heart of Darkness’ to ‘Africa Rising’ (pp. 200–210). Oxford: Routledge. ISBN 978-1-138-96232-3. Abubakar, A.T. (2016). Audience participation and BBC’s digital quest in Nigeria. Everyday Media Culture in Africa: Audiences and Users (pp. 140–160). ISBN 978-1-138-20284-9. Tasiu Abubakar, A. (2014). British public diplomacy: A case study of the BBC Hausa Service. In Mirchandani, R. and Abubakar, A.T. (Eds. ), Britain’s International Broadcasting (pp. 31–49). California, USA: Figueroa Press. ISBN 978-0-18-217054-8. Tasiu Abubakar, A. (2018). Hostile gatekeeping: The strategy of engaging with journalists in extremism reporting. Defence Strategic Communications, 5(Autumn), pp. 51–87. doi:10.30966/2018.RIGA.5 . Tasiu Abubakar, A. (2017). Strategic communications, Boko Haram and counter-insurgency. Defence Strategic Communications, 3(Autumn), pp. 139–169. Tasiu Abubakar, A. (2013). Selective believability: A perspective on Africans’ interactions with global media. Journal of African Media Studies, 5(2), pp. 219–236. doi:10.1386/jams.5.2.219_1 . 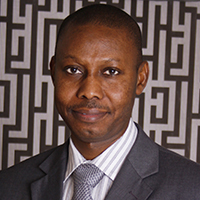 Tasiu Abubakar, A. (2012). The media, politics and Boko blitz. Journal of African Media Studies, 4(1), pp. 97–110. doi:10.1386/jams.4.1.97_7 . Media Ethics Think Tank Conference. Doha, Qatar (2019). Invited speaker. Social Media in the Defence & Military Conference. London, United Kingdom (2018). Invited speaker. Annual Conference of the International Association for Media and Communication Research (IAMCR). (Conference) Eugene, Oregon, United States of America (2018). Strategic Communications: Working with Host Nation Journalists. Swindon, United Kingdom (2018). Description: Presentation at the Defence Academy of the United Kingdom (Joint Services Command and Staff College), Shrivenham, Swindon, UK, 26 January 2018. Elections in Africa, Virality in Media and Democratic Participation. (2017). Defence Strategic Communications Seminar. Shrivenham, Swindon, United Kingdom (2017). Description: Presentation at the Defence Academy of the United Kingdom (Joint Services Command and Staff College). Seminar at the Defence Academy of the United Kingdom. Shrivenham, Swindon, United Kingdom (2017). Invited speaker. MECCSA Annual Conference 2017. (Conference) University of Leeds, United Kingdom (2017). Panel Member. Paper: Digital Engagement: The BBC and ‘Active’ Audiences in Africa. Panel on ‘Reporting Africa: Reaching beyond the Dark Continent?’ City, University of London (2016). Panel Member. Description: Discussant on the panel on ‘Reporting Africa'. The Social Media and Challenges of Election Coverage in Nigeria. Abuja, Nigeria (2014). Invited speaker. Description: Presentation at the Media Trust Workshop on Elections Coverage. On Political Reporting and Investigative Journalism in Nigeria. Abuja, Nigeria (2013). Description: Presentation to Media Trust journalists. ICTs and Social Change in 21st Century Africa: New Public Spheres, Opportunities and Limits. London (2012). Description: Panel discussant at the Conference on ICTs, New Media and Social Change in Africa, organised by the Africa Media Centre, University of Westminster. Reporting for the BBC and the Boko Haram Phenomenon in Nigeria. University of Westminster, Harrow Campus (2012). Description: Presentation to international journalism students at University of Westminster. BBC’s Engagement with Northern Nigerians. University of Westminster, New Cavendish Campus (2009). Description: Conference presentation at the African and Arab Media Audiences Conference, 30-31 March 2009.